We finally went kayaking for the first time this year and it was so beautiful and relaxing. I can't really find the right words to describe what paddling does for my spirit. It just makes me want to invite everyone I know and love (and even people I don't know!) to try it out and reap the benefits of some quiet time with Mother Nature. I've written about Dubes Pond in Hooksett a couple of times before. (You can read a short piece I wrote for paddling.net last year) If you've never tried it, I highly recommend it for a good early-season or late-season paddle. By mid-summer, this shallow pond is sure to be choked with vegetation. Basics: As you first set out from the launch, you'll see a water skiing channel (marked by buoys and flags). Don't be put off by this or you could miss a jewel of a pond. You'll soon lose sight and sound of the small water skiing area and will be drawn instead to some open water, small islands, and many marshy channels to explore. Watch for granite boulders throughout this 94-acre pond. Wildlife: The heron rookery we saw two years ago appears to be gone, but we did see a heron, also several geese, ducks, turtles, and a number of fresh beaver lodges. Special Notes: The area we launched from last year near the picnic table is now posted as private property. The adjacent public launch is a little rocky, but do-able. There are no public facilities here. Directions: From Manchester, take Routes 3/28 north and turn right onto route 27. The boat access is on the left, just a little more than 2 miles beyond the junction with Bypass 28. You can drive up to unload your boat and then park across the road. Blog Note: I'm working (with help) on a new design. Still in progress, so hope you'll be patient as I try to get all the features where I'd like them to be! We went to the Contoocook River Canoe Company Kayak and Canoe Demo in Concord yesterday. 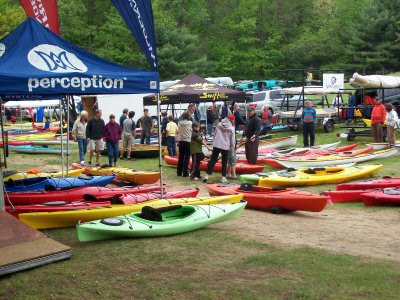 There were lots of manufacturers, hundreds of kayaks, paddles and other gear, and some very helpful salespeople. So helpful, in fact, that we parted with some serious money for Werner paddles. Can't say which "model" we bought, but they're made of carbon and light as air. You can read more about Werner paddles and take a quiz that will help you choose the right paddle on their website. I also discovered that if you register your new paddle on the site, Werner will donate a percentage to an outdoor non-profit organization you select from a list of options. Pretty cool (even though it's an obvious marketing ploy to get your e-mail address). Is anyone looking for kayak (or water) shoes? After months of searching, Doug found some last week at Alec's Shoe Store in downtown Nashua. They had a big selection. I love my L.L. Bean shoes bought a few years back at a kayak show. They give me good footing at those rocky put-ins and they dry so quickly. And now it's confession time: we're usually out on the water by this time of year. What's the hold-up and why all the chatter about gear? The truth is I'm having back problems and I'm delaying getting out on the water until my back can "mend" a little. I feel like one of those high-priced ball players. You know -- when they put them on the disabled list so they won't risk a more serious injury and be out all season? Um, yeah, that's me. Feathering is when you offset the blades on your paddle -- so if you held out your paddle in front of you, one blade would be level and the other would be at a 30-degree angle, for example. I'll write more on that later. For now, I'm off to ice my back and work more on the blog design. Sometimes it's tough to choose between the two. This Sunday (May 17), for example, there are two events taking place simultaneously that sound interesting in terms of being information-packed. The first program is a kayaking demo I wrote about earlier. The second event is a Trail Expo at Hampshire Hills Sports and Fitness Club in Milford, focusing on rail trails, wildlife, and conservation. Featured speaker is Charles Martin, who wrote the book on rails trails in the state. 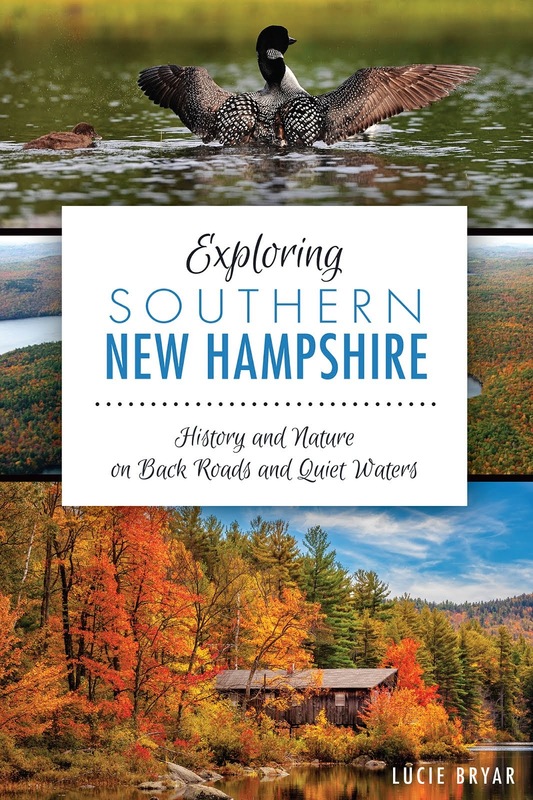 Aptly enough, his book is titled New Hampshire Rail Trails. You can read more about the Expo at Nashuatelegraph.com: Take a hike at the NH Trail Expo. 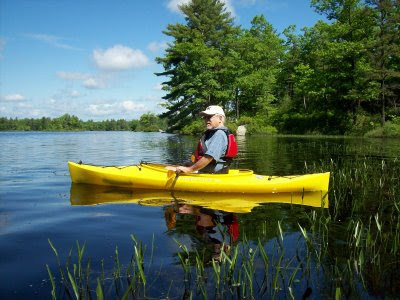 We've decided to take part in the kayak demo at Contoocook River Canoe Company because we're looking for some new gear and this should give us a chance to try it out on the water. As far as the talk on rail trails -- well, maybe I'll just buy Martin's book. I browsed through a copy at a bike shop a while ago and it seemed like a good source of information. 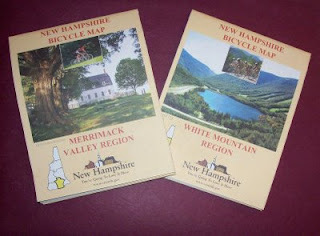 It took a little work, but I did get some "official" 2008 New Hampshire biking maps put out by the Department of Transportation. My first stop was a local bike shop, but the map they gave me was a few years outdated. Next I stopped at the State Rest Area (Tourist Information Center?) near exit 6 in Nashua. Success! They gave me two maps: one for the Merrimack Valley Region (where we live) and another for the White Mountains (where we're headed in a few weeks). The maps are pocket size, maybe 3 by 4 inches when folded. Obviously, they're available by tourist region - I think there are six or seven in the state. The downside is that New Hampshire doesn't seem to have that many decent off-road bicycle routes that are suited for touring (not mountain) biking. The maps show "recommended bike routes," most of which are regular paved roads. They also show "improved rail trails," and "unimproved rail trails," as well as what they call "recreational bicycle loops." Just to give you an idea, the Merrimack Valley Region has three recreational bike loops and four bike paths, some of which are pretty short. I'm going to study them a little more closely to see what I can learn and will try to share information here. For now, if you'd like a bicycle map of your own, go to your nearest state rest stop and ask at the counter, if there is one. The maps aren't available in the "take-one" racks, you have to ask for them. Hope to see you on the trail! Where in NH Are You Biking? 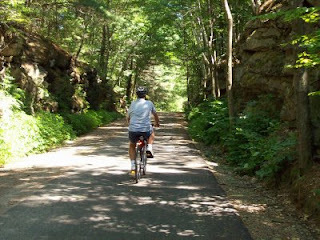 We took our bikes out last Sunday and took a short 6-mile ride on the Nashua River Rail Trail. It's a scenic 12.5-mile paved trail from Hollis to Ayer, MA. Saw a near collision between a big ol' snapping turtle trying to cross the trail and an unsuspecting bicyclist. Reminds me I need to pay close attention to my surroundings. That turtle was big! I'm on the hunt for more bike trails and paths to explore this year. Of course, we have some tried and true favorites. Nearby Mine Falls Park offers lots of variety through wooded areas between the Nashua Canal and Nashua River. That's a good one for us because it's so close. A co-worker from Hudson remarked this week that she wonders why it doesn't get "more publicity." And then there's the short but nice Windham trail. Good for when you're short on time, but still want to get outdoors. My hunt for new trails this winter led me to the NH Bike-Walk Alliance website. I've actually been following the work of these incredible bike enthusiasts for a while. They have one page devoted to rail trails in the state, including those in the early planning stages. From their homepage, look for a link that says "NH Rail Trail Index." In 2008, the folks at the Department of Transportation also worked long and hard with bicycle groups throughout NH, including the Bike-Walk Alliance, to create bicycle maps for the state. They're available for download here, but I haven't had much success getting these to print out in a readable format. The maps show improved and unimproved rail trails, on-road routes and bike paths. Apparently, the maps are available in limited supply at the state's rest areas and select locations -- but you have to ask for them. At least that's the word on the Bike-Walk Alliance website. So my mission this week is to track down a hard copy of the state's "official" biking map. In the meantime, if you have a favorite bike trail in your own backyard, please write and let us know!